Again I'm back on Hollywood Blvd. 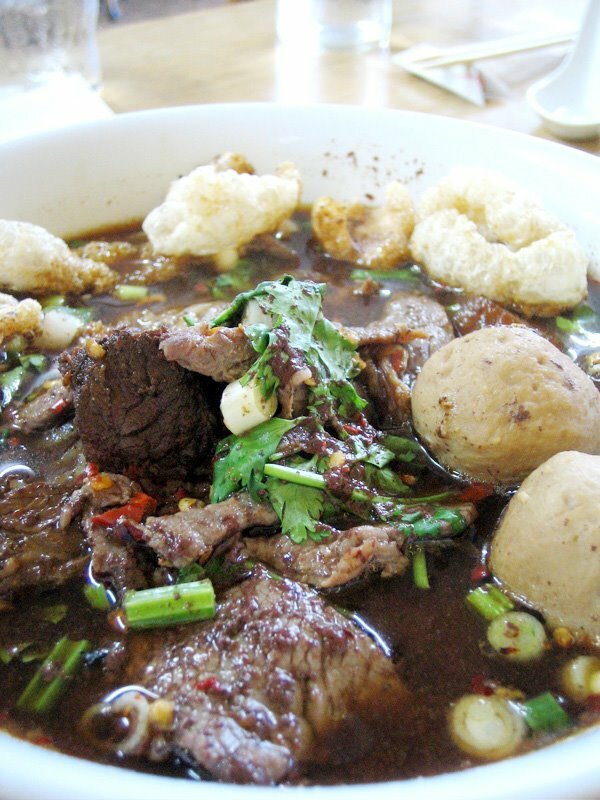 whoring for the perfect bowl of Thai Boat Noodles in Thai Town. My last 2 experiences at Yai and Red Corner Asia were satisfactory, with Yai reigning supreme over RCA. RCA really didn't do it for me. J and I were headed to a wine tasting at Silverlake Wine and craved a bowl of noodles before we got liquored up. I was craving Thai Boat while she was in pursuit of a good bowl of roasted/bbq duck noodles. After a year of corresponding with Yoony of Immaeatchu through the food blog, we felt it was time to finally meet the young lady behind the delicious cooking. 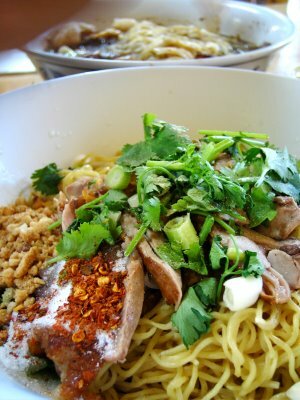 She and Santos of Meet Me At the Corner of Third & Fairfax got us hyped on this current Thai food spree. A friend of mine recommended Sapp Coffee Shop because she knows how much i love Thai Boat Noodles. 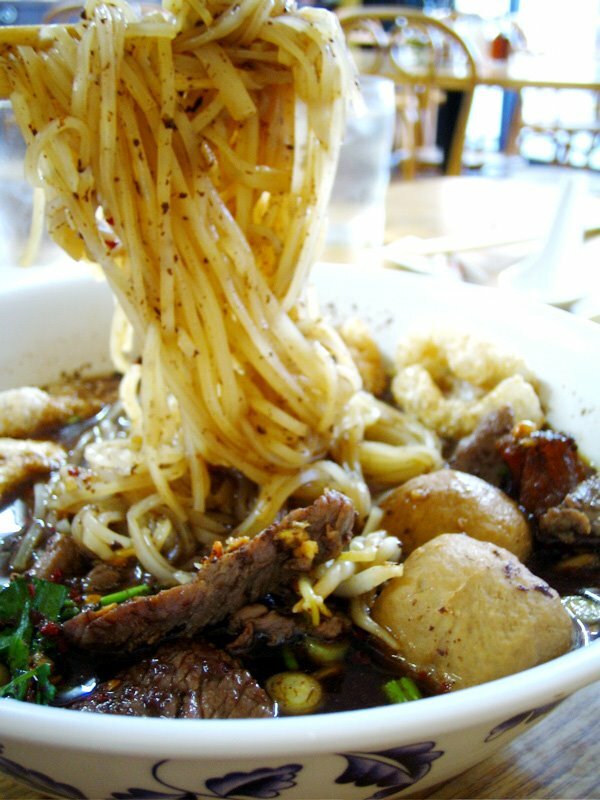 For those that haven't had this, it's almost like pho with the beef parts, but the soup is brown and much thicker. Why is it thicker? It's because authentic TBN's are made with beef and pork blood. Don't close this window just yet - it's tastier than you think. The result of incorporating blood is a nice gravy-like soup that is packed with flavor. Sapp Coffee Shop is a favorite of young people because it's known as a diner, with rice and noodle dishes and a list of delectable Thai drinks. 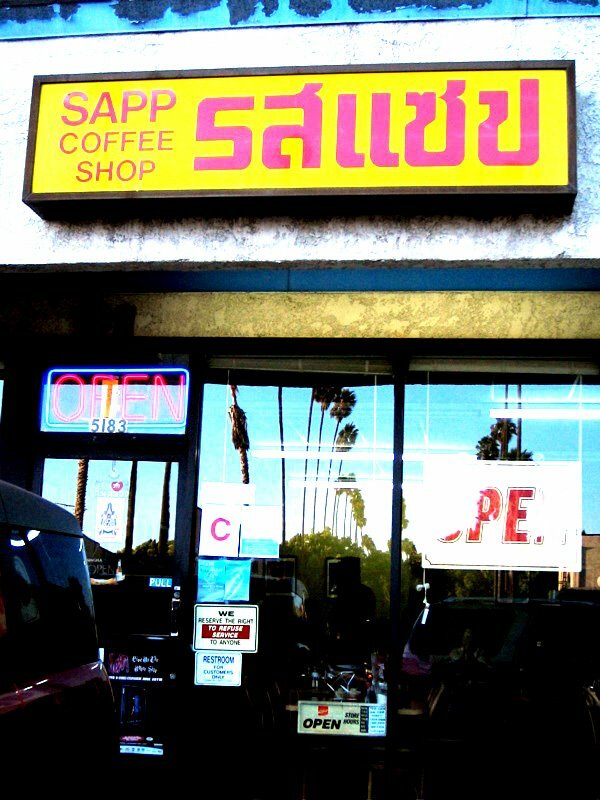 Although Sapp Coffee Shop is a Thai restaurant, the word 'sapp' is Laotian for 'tasty, delicious'. And rightfully so. J, Yoony and I met at 7 pm and piled into this hole-in-wall restaurant marked with a "C". But don't mind the "C", it really means 'clean enough'. If you're a prude, ambiance-seeking eater, you probably shouldn't be frequenting Asian restaurants PERIOD. After all, Asian restaurants are all about the food. After about 10 minutes of chatting, we picked up the menu to order food. The girls both got the dry roasted duck noodles which they fell in love with at Yai. I, of course, got the TBN's. Here's what we thought. Nevermind the 'C' rating here, I give Sapp Coffee Shop an 'A'. Hurry on over here, they close at 8:30 every night and rest on Wednesdays. Here is another review by a Sapp fan from the LTH Forum.